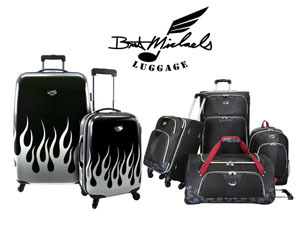 The Live Bret Michaels store at Overstock.com continues to expand and now Bret has new luggage collections by Traveler's Choice. The exclusive limited collection is available only on Overstock.com HERE. Visit bretmichaels.com to see a sneak peek of the exclusive collections. Both the Classic Road and the Road Tour line of luggage were designed by Michaels, who drew inspiration from his relentless tour schedule as he spends over 200 days a year on the road traveling and living out of a suitcase. Michaels, who travels both professionally and personally created the luggage to be not only durable and functional but with unique designs and sleek rock star details to make your luggage stand out amongst the crowd. Michaels has been personally working with Overstock.com to develop branded products, available exclusively on the company's online shopping website, that draw from his hands-on design experience. Michaels was also personally involved in the design process of the Bret Michaels Rock Star Suite at the Hard Rock Hotel Riviera Maya, and the Bret Michaels Hospitality And Music Room at St. Joseph's Barrow Neurological Institute in Phoenix. "I don't stand behind things I don't believe in," continued Michaels about the partnership. "I'm truly a person that shops on Overstock.com and have done so for a long time. I'm excited to have a chance to personally develop products like the ones in my house, on my bus, in my life."